The stainless steel tool caddy and organizer puts all your drive heads and accessories in one place. It holds 4 drive heads (1 is mounted on the driver) the # 5 ball end allen wrench, the pencil magnet, and the vertical clamp hold down pads. 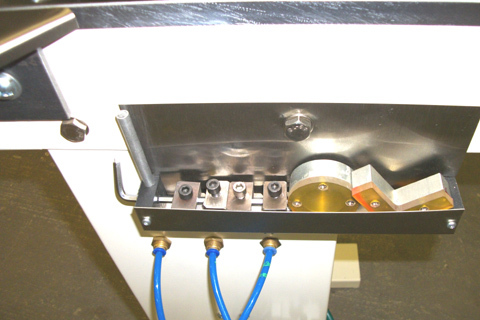 The stainless steel caddy mounts onto the side of the PPFE 1000 using the screw that is already on your machine. The cost of the accessory stainless steel tool caddy is $39.95.